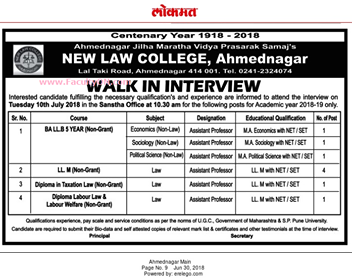 New Law College, Ahmednagar has advertised in Lokmat for the recruitment of Assistant Professor jobs vacancies. Interested and eligible job aspirants are requested to appear walk in on 10th July 2018 . Check out further more details below. About College: Ahmednagar Jilha Maratha Vidya Prasarak Samaj, the leading & pioneer educational Institution in the Ahmednagar District & the Parent Institution of the New Law College, Ahmednagar was founded in the year 1918. Initially the Society started the Maratha Boarding for poor students from rural part of the District after the name of Late Karveer Hutatma Chhatrapati Chauthe Shivaji Maharaj, father of Rajarshi Shahu Maharaj, who fought bravely against the British Rulers and was tortured, confined and killed in the Ahmednagar Fort. Chhatrapati Shahu Maharaj, Kolhpur donated some amount to the boarding. The founders of the society were highly motivated and inspired by the teachings of Late Chhatrapati Shahu Maharaj, Mahatma Phule, Maharshi Vitthal Ramji Shinde, Karmveer Bhaurao Patil etc.